I’m from New Jersey. We take our pizza very seriously. When I go for a visit, the first thing I do (after a trip to Wawa) is get a piece of pizza from my favorite pizza shop. (Primo’s Pizza. No kidding, it’s the only phone number from my childhood that I remember.) And I get another one right before I leave town. And probably once or twice during my visit. My love for pizza runs deep. I’m not ashamed. For excellent pizza the crust must be thin. It must be crisp. (It should be able to be held in your hand without drooping.) It cannot have too much sauce. Or too much cheese. A great piece of pizza is like a piece of artwork. Everything works together and is in balance. Making great pizza at home can be a challenge. In my experience, my pizza at home has always been good, but not the kind that I crave (and dream about) from my home state. Not anymore. You guys, I have it figured out. The key to incredible pizza at home is a great crust recipe, the highest quality ingredients, and an oven so hot it will burn your arm hairs off. 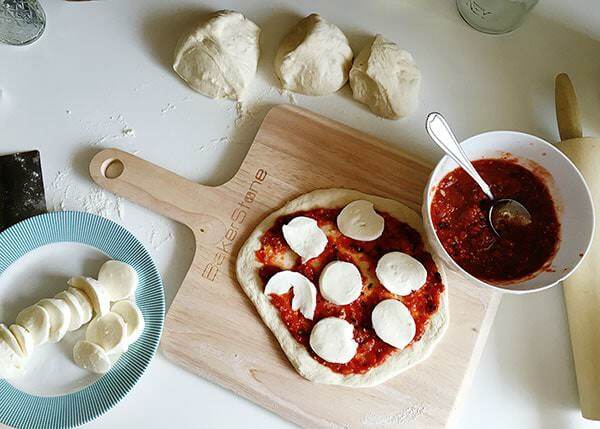 I’m going to share with you some of my best tips for making crave-worthy pizza at home. 1. You need to use the best ingredients you can get your hands on. We are fortunate to have a little Italian market close to us that carries only products from Italy. (I can’t read most of the labels, I trust them to tell me what I am buying.) Italian 00 flour is a finely milled flour that is worth looking for. The dough is soft, but also easy to work with. Extra virgin olive oil. You are going to use it to finish your pizza, so use the best you can afford. San Marzano tomatoes, and the only time that I insist on them being whole. 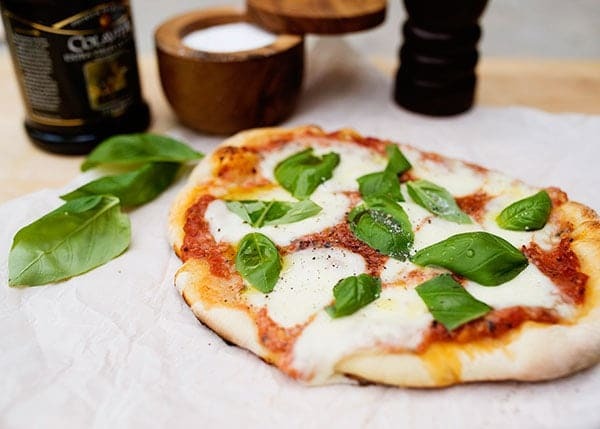 Fresh mozzarella cheese, I used two different kinds and I actually prefer the kind that is not in water (it’s fresh, but wrapped tightly in plastic wrap), it holds it’s shape better and doesn’t weep on the pizza. Sea salt and pepper. In my opinion, this is what makes all the difference. A little sprinkle before you take a bite and it changes everything. Fresh basil. 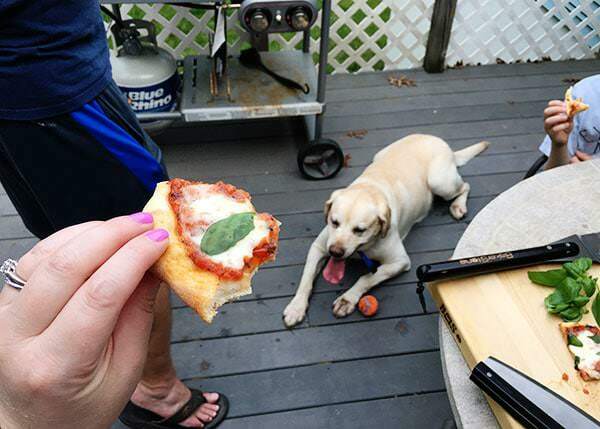 You cannot have a Margherita pizza without fresh basil. 2. The highest temps you can get. Run to Sam’s Club (or order online) and get yourself a BakerStone Box. Seriously, I get a lot of kitchen stuff sent to me and more often than not I try it and it never sees the light of day again. But this, I am so excited about. A BakerStone Box is a pizza oven that goes on top of your GRILL. It gets to crazy (arm hair sizzling) temperatures and makes the crispiest, most delicious pizza known to mankind. Now, if you live in New England, you know that most homes are not air-conditioned. Mine is not. I will do just about anything to not turn on my oven in July and August. I will be using my BakerStone every day. Not only does is make perfect pizza, but it also can roast meats and vegetables. If I was a camping sort of girl, I would also think that this is the best tool ever. I made a hot Mexican dip in it and it worked perfectly. (I’ll share that recipe soon.) I am going to try and bake a few desserts in it too. 3. Don’t weigh your pizza down. Too many ingredients will make your pizza heavy. Just a few spoonfuls of sauce, just enough cheese to get it in each bite but not so much that it oozes everywhere. Same goes for toppings. A little goes a long way. 4. Let it cool for a bit before slicing. This is a hard one. 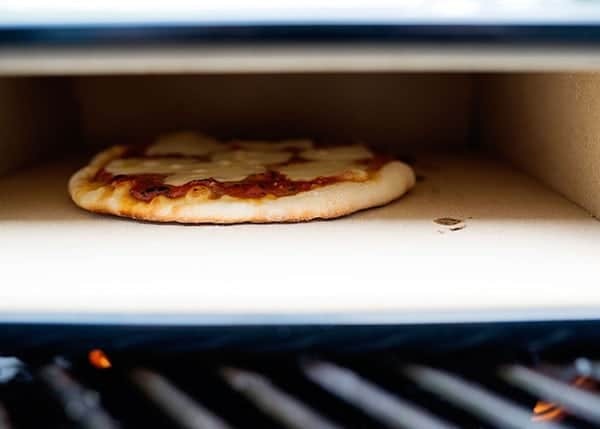 As soon as it comes out of the oven you want to get busy, but let the cheese cool a little for cleaner slices (and not burning the roof of your mouth.) This way your cheese won’t fall off the crust. To make your pizza, roll the dough out as thinly as possible. This crust recipe made 4 small pizzas. I stretched and pulled more than rolled. Letting the dough sit on the counter for about 15 minutes before I rolled it out helped a ton to get it thin. I used about 2-3 tablespoons of sauce and the back of a spoon to spread it thinly all over the crust. Top with slices of cheese. They baked in about 7 minutes. Add torn basil leaves to the top, drizzle with olive oil, and salt and pepper. HEAVEN. The pizza was so good that we didn’t even bother to sit at the table and eat it. We stood on the porch and ate it as they came out. I can’t even describe how good it was. Here’s to the best pizza ever. 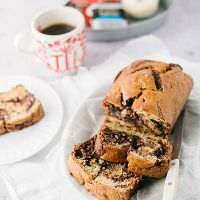 This is the best recipe I’ve found. It makes enough for 4 small pizzas, or 2 large. 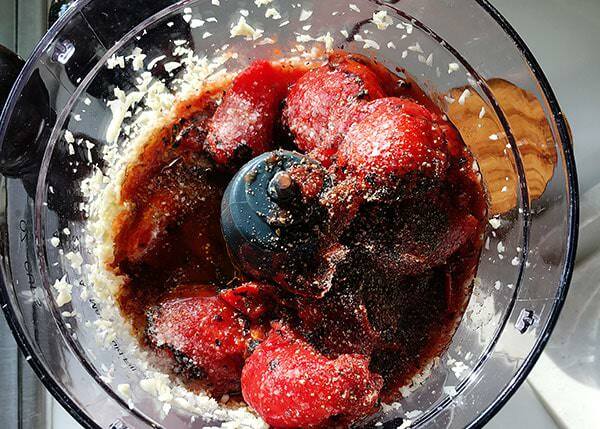 Turn the mixer on low and add the salt and 2 tablespoons of olive oil. Add the flour, a little at a time, mixing at the lowest speed until all the flour has been incorporated. When the dough starts to come together, increase the speed to medium; stop the machine periodically to scrape the dough off the hook. Get a feel for the dough by squeezing a small amount together: if it’s crumbly, add more water; if it’s sticky, add more flour – 1 tablespoon at a time. Mix until the dough gathers into a ball, this should take about 5 minutes. Turn the dough out onto a lightly floured surface and fold it over itself a few times; kneading until it’s smooth and elastic. Form the dough into a round and place in a lightly oiled bowl, turn it over to coat. Cover with plastic wrap or a damp towel and let it rise in a warm spot (i.e. over a gas pilot light) until doubled in size, about 1 hour. Tyler’s Recipe can be found here. Give a taste and add more salt, pepper, or vinegar as needed. Drain the tomatoes for a slightly thicker sauce. Makes enough for about 8 pizzas. Freeze any extra pizza sauce for up to 3 months: Spoon any unused sauce into muffin tins. Freeze until solid, then pop the frozen cubes out of the mold and transfer to a freezer container. Thaw overnight before using on pizza, or microwave the cubes in 30-second bursts until they melt into a sauce. BakerStone gifted me a BakerStone Box, but all opinions are 100% my own. I love this oven and will giving one to all of the dads in my life for Father’s Day. I’m glad you reviewed the Bakerstone. I first read about it in your weekly newsletter. We just bought a new grill and unfortunately, the Bakerstone won’t fit on it. We might try and sell the grill and upgrade to a bigger one just so we can use a Bakerstone on it. I don’t want to invest in either until I know the Bakerstone is worth it. I too have a bunch of kitchen products that don’t get used very often. I try to make pizza every Friday night and I think this would be a great investment. Thanks! They make a smaller Bakerstone too. Mine is the smaller one. Oh yes! Grilled pizza is wonderful! And for the mozzarella, have you ever tried making your own? It’s very easy and you can order kits off Amazon. We’ve used milk from the store and milk from a farm – either way it’s a whole new level of yum! This pizza isn’t grilled, it just is made on a grill in a bakerstone box. It’s a very nice recipe, I’d add fresh rucola, lettuce dipped in cold water to make it crunchy and parma ham after its ready as garnish. After the meat starts to sweat, is when I’d add the rucola and basil. This recipe looks so good! I’m a huge pizza fanatic, especially when it comes to authentic style recipes. 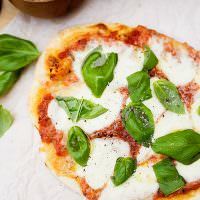 I’m a terrible cook however, and as much as I would love to whip up my own pizza at home, I’d rather rely on a good restaurant that utilizes many of the same ingredients as this recipe. 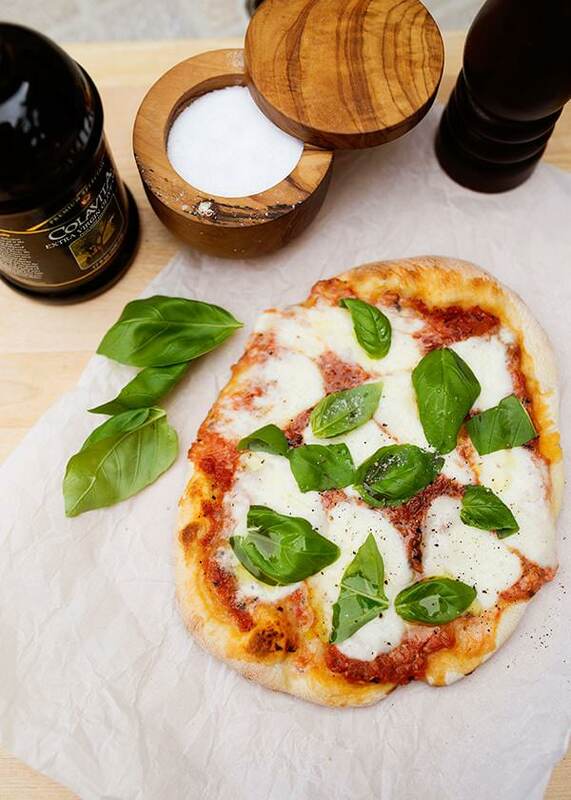 Fresh mozzarella, fresh basil, and a good sauce are on my list of what an authentic Italian pizza should have. Agreed! Good pizza is always made with great ingredients. I never thought about adding balsamic vinegar to the tomato sauce. It does seem like it would add a good touch of both acid and flavor. I wonder how hard it is to make a good tasting pizza. It isn’t hard at all. Give it a try. I generally don’t like thin crust. I actually love fluffy crusted pizza, I’ve been craving fluffy crusted pizza for the past week. I’ll have to see if my husband will take me to get some this week. I’d be one of the happiest people on earth if I got some pizza. Thanks for the tips on cooking pizza at home! My wife and I have decided to start home cooking a lot more, and I love the idea of making our own pizza. I appreciate you mentioning to stretch the dough really thin. I like a thin crust pizza, so we will give this a try. Thanks for these tips for making a good pizza. I’m glad that you explained that you should start cooking on the bottom as soon as you can. I’m kind of interested to learn if you should have a timer set up for this so you can make sure that you not only get the right temperature but cook it for long enough. I don’t set a timer. If your temp is hot enough, it doesn’t take very long at all. I like how you said that for excellent pizza the crust must be thin and it must be crisp. I want to go out to eat pizza this weekend. Thanks for the tips on how to make the best pizza. I stand by that. Soggy pizza is the worst. I don’t know where to start, I’m looking at this post and can’t stop with the constant mouth watering! 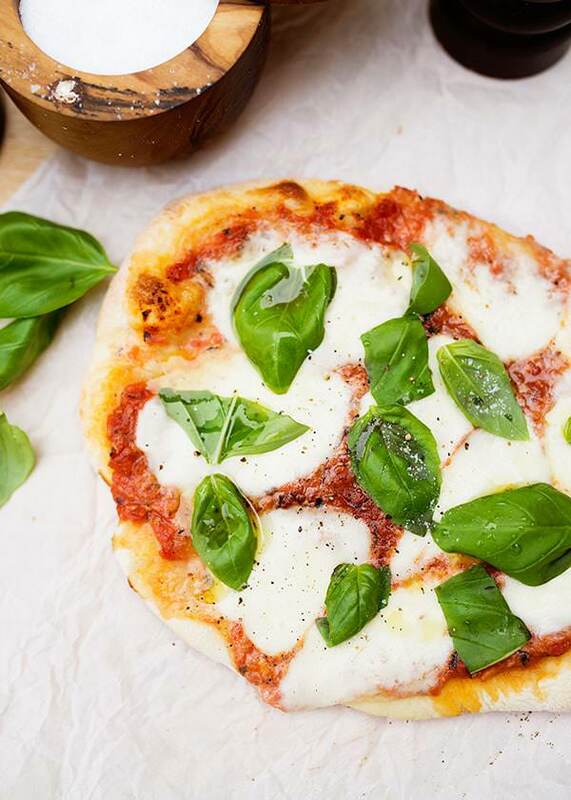 These are the most beautiful pizza pictures I’ve ever seen! I’m thinking a tall glass of red wine and a slice! Thanks for sharing this!!! Now I want pizza too!